1.- I assigned the class name ‘sizes' to the field. 3.- How can I access to the (li) and (ul) lists of a specific css class? Seriously three days and no answer? 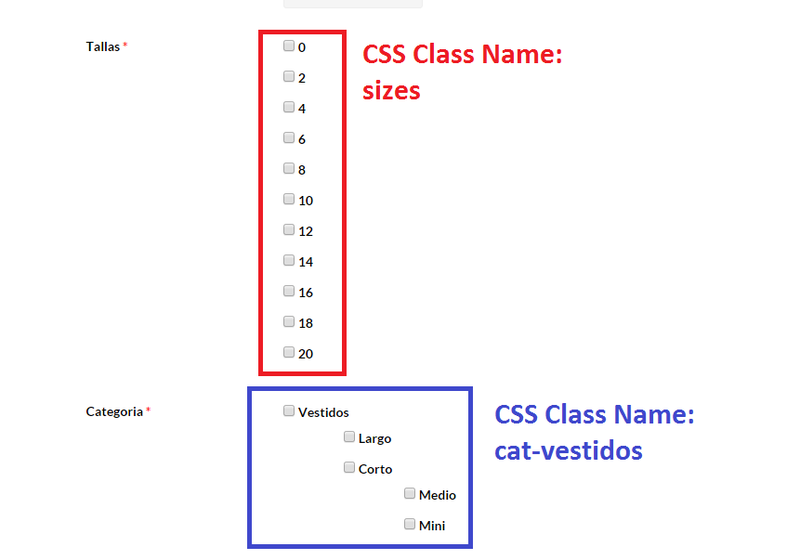 Why add a ‘CSS Class Name' to the Form Elements if they dont work for li and ul auto-generated? I am really sorry for my late reply. Can you please let me provide a screenshot about the issue. Then it will help me to provide a right explanation. However I want to ONLY change the style of the specific checkboxes with the CSS class ‘sizes'. But it mess up all since it applies to all checkboxes not only to the specific checkboxes with the ‘sizes' class name. I need only to style the ‘sizes' checkboxes. Sorry it connects via SSH, so I can't provide login credentials. I just want to style a specfic set of checkboxes assigned to a CSS class name. Not ALL the checkboxes. Is it possible? Just provide me wp-admin access. I need to check the form you have created then it will be easy for me to provide support. I am very glad to know that you have solved the problem. I am going to mark this topic as resolved and closed. The topic ‘Styling the list of CSS’ is closed to new replies.